Before buying a pair of speakers, the shopper must consider several factors. The most obvious one is budget, as that will dictate which part of the loudspeaker market the shopper should focus on. The second factor is speaker size, and this brings up a host of questions to be answered: How big is the room in which the speakers will be used? What electronics will power them? How loud do they need to play? Can the speakers be placed where they sound best, or will the buyers partner want them close to the walls? How much low-end extension is desired? And so on. For my own system, I decided on a pair of bookshelf speakers, largely because I find them easier to position to get an even tonal balance, a convincingly three-dimensional soundstage, and satisfying bass. That said, I enjoy a variety of music, some of which has bass that goes well below my speakers lower limit. This is why its fun for me to review floorstanding speakers, for the visceral impact they can impart to music. So it was with some enthusiasm that I received a pair of Focus Audios Classic FC 9 speakers ($1999 USD per pair) and cued up some music. Located just east of Toronto, in Markham, Ontario, Focus Audio began designing and manufacturing loudspeakers in 1993. Today the company has several product series, including the Multichannel, Prestige, Classic, and Signature, as well as their flagship line, the Master Series. 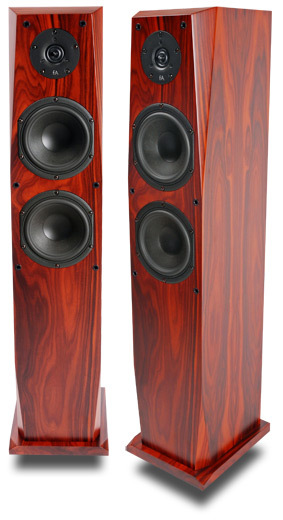 The FC 9, the largest floorstander in the Classic Series and the subject of this review, embodies the emphases that Focus places on craftsmanship and quality control. The fitnfinish of the FC 9 is perfect, and its warm veneers of real cherrywood (dark rosewood is also available) are matched: each speaker of one pair is a mirror image of the other. The clean lines of its contoured front baffle lend the FC 9 a softer appearance that makes it seem less imposing than its actual size: 43"H x 8"W x 13"D. The pictures on Focuss website dont do the FC 9 justice; you need to see it in person, and run your hands along its cabinet, to fully appreciate the attention to detail that has gone into this speaker. While $1999 isnt cheap for a pair of speakers, its not outrageous for something of this size that makes music and looks like fine furniture. Each FC 9 weighs 62 pounds, this considerable weight the result of using thick MDF: 1" for the cabinet walls and 2" for the front baffle. Focus claims that the baffles nonrectilinear shape is intended to improve imaging, presumably by reducing the amount of diffraction that occurs when high-frequency soundwaves are reflected off and radiate outward from the cabinet edges directly surrounding the tweeter. Although the FC 9 comes with front grilles, I didnt use them; they didnt benefit the sound, and hid the baffle and drivers, which I wanted to see. The three-driver FC 9 is a two-way design: the 1" Vifa ring-radiator tweeter crosses over to the two Peerless 7" long-throw Nomex woofers at 2kHz. The crossover is reportedly of high quality, with high-purity copper coils and polypropylene capacitors. The tweeter is cooled by air rather than the ferrofluid common in many other speakers, including my own PSB M2s. With two 7" drivers working in parallel to produce musical information below 2kHz, I anticipated a speaker with some weight down low. The FC 9s frequency response is a claimed 35Hz-25kHz, +/-3dB, and its sensitivity is on the high side, at 91dB/W/m; the nominal impedance is 4 ohms. With such specs, the FC 9 is nearly a full-range design, and should be a relatively easy load for any amplifier comfortable with 4-ohm impedance. During the review period the volume knob of my 100Wpc integrated amplifier rarely traveled past 10 oclock, except when I listened to LPs, which output a lower signal than CDs. However, if you have a big room and/or like to play your music loud, Focus claims that the FC 9 can handle 20-500W of power -- it should be able to handle almost anything you can throw at it. It also has two pairs of binding posts, should you decide to biamp or biwire. If your room would better accommodate a smaller floorstanding speaker, there are two others in the Classic series. Both use the same 1" tweeter as the FC 9 but differ in their woofer configurations. The FC 7, reviewed in April of 2009 by Colin Smith on GoodSound!, has a single 7" woofer and measures 38"H x 8"Wx 10"D ($1400/pair). Almost identical in size is the FC 8, at 38"H x 7.5"W x 10"D and with two 5.25" woofers ($1700/pair). I drove the FC 9s with a Bryston B100 SST integrated amplifier, to which they were connected using AudioQuest Type 4 speaker cables terminated in banana plugs. An AMX Optimum AVC 31 coaxial cable linked the digital output of an NAD C542 CD player to the DAC aboard the Bryston. My Thorens TD-160HD turntable is fitted with a modified Rega RB250 tonearm and Dynavectors DV-10X5 high-output moving-coil cartridge. All electronics were plugged into an ExactPower EP15A power conditioner. The first time I listened to the FC 9s, I was amazed by how awful the bass sounded. Higher in the audioband everything was much clearer, but the bass was way too overblown in my room. The problem wasnt only the quantity of bass but its quality: It lacked punch and grip, instead sounding slow, fat, and muffled -- and no matter where I positioned the speakers, I couldnt fix the problem. After listening to them for 10 to 20 hours, I set them aside and reinserted my PSB M2s so that I could work on another review. Several weeks later I reinstalled the FC 9s and found the quality of the bass substantially improved, and it continued to improve over the next few days. By the time I began taking notes, it was as if I was hearing the FC 9s potential for the first time. In the past Ive reviewed speakers that needed some break-in, but this normally took only a few hours, not a few days. Whats more, none of these speakers underwent the almost complete transformation I experienced with the FC 9s. I ended up positioning them so that the front baffles were 45" from the front wall and the center of the tweeter was 30" from the sidewalls. The speakers were 70" apart, and toed in slightly so that the tweeter axes crossed just behind my head. Although the FC 9s bass performance at first concerned me, it ended up being one of the qualities I most admired in the speakers sound, fulfilling my desire for a more visceral listening experience while maintaining the level of quality I expect from a speaker at this price. Through the FC 9s, low frequencies had the kind of weight and brawn that simply arent possible from a bookshelf speaker with a smaller cabinet volume and woofer. The impact and solidity of the kick drum on "Alameda," from Elliott Smiths Either/Or (CD, Kill Rock Stars krs 269), were impressive, bestowing on the drum kit a real sense of heft. The same was true of the Great Lake Swimmers "Your Rocky Spine," from Ongiara (CD, Nettwerk 30691 2), in which the kick drum was warm and clear -- not displaying the last ounce of detail, but sounding full and present while providing the music with a toe-tapping rhythmic foundation. Perhaps the greatest strength of the FC 9s bass reproduction was that it wasnt out of step with the rest of the music. The speaker was tonally well balanced and, despite my first impression, not bottom-heavy. As much as I enjoyed the greater senses of scale and weight the FC 9s brought to much of what I listened to, I was most impressed by their ability to precisely image. Pinpoint imaging is something I usually associate with minimonitors, but the FC 9s had me reevaluating that assumption. Their ability to portray instruments and voices accurately across the stage was stunning. On Elliott Smiths "Angeles," also from Either/Or, his double-tracked vocal was revealed with crystalline clarity, sounding upfront and well separated. The FC 9s consistently reproduced voices with a sound that was lucid, open, and transparent, helping to bring various singers into my room and, in the process, adding a feeling of intimacy to the music. Their ability to produce stable, focused images across the stage further helped to convey a sense of authenticity to the music. It was easy to close my eyes and imagine the performance taking place in front of me. This was particularly true when I listened to Shady Grove (CD, Acoustic Disc ACD-21), a collection of traditional folk songs and ballads performed by Jerry Garcia, David Grisman, and a small group of bluegrass musicians. This is a beautiful recording to begin with, but you need a great speaker to reveal it as such. The Focus FC 9 qualified: The clarity of the guitar, banjo, and mandolin were almost beyond reproach, the crisp resonance of the strings sounding as clear as day, each instrument cut out with near razor precision. The FC 9 had a wide dynamic range, able to instantly go from soft to loud. This was especially nice when listening to classical works such as Rachmaninoffs Symphonic Dances -- the energy of the Minnesota Orchestra, led by Eiji Oue, was invigorating (CD, Reference RR-96CD). My bookshelf speakers can play plenty loud when asked to, but its the effortless sense of scale that larger speakers, such as the Focus FC 9s, bring to music that separates them from their smaller brethren. My only regret is that I wasnt able to play them in a bigger room so that I could test them to their limit. With their superb imaging, it might be possible to place them farther apart and still achieve good center fill. That said, even with the speakers just under 6 apart I was still easily able to "see" the Minnesota Orchestra spread out before me across a broad, deep stage. I compared the New Classic FC 9s to my reference speakers, the PSB Platinum M2s ($1999/pair). The M2 is a two-way design with a 1" aluminum tweeter and a 6.5" woofer; introduced in 2004, it was a benchmark bookshelf speaker at the time, and still holds its own six years later against more recent offerings from PSBs competitors. Despite the difference in their sizes, I was surprised to hear how similar the FC 9 and M2 sounded in some areas. One of these was retrieval of detail: both speakers were close to the best Ive heard (that honor goes to the Usher X-718). As I cued up Smiths "Angeles" again, both the Focus and PSB were commendable in their ability to expose subtle details, such as the sliding of Smiths fingers up and down his guitars fretboard. His voice, too, was reproduced with wonderful clarity by both pairs of speakers, holding a stable position just in front of the plane of the speakers. Eddie Vedders soundtrack album for Into the Wild (CD, J Records 15944-2) revealed a bit more. In "Society," Vedders voice sounded similar through both pairs of speakers, but it was in the sound of the reverberation on his voice that the PSB and Focus diverged. Through the FC 9s, this track sounded as if it had been recorded in a larger hall than through the M2s, which were unable to communicate that sense of an immense acoustic so effortlessly re-created by the FC 9s. Listening to the dance Non allegro from Rachmaninoffs Symphonic Dances made further differences between the two speakers immediately obvious. The crash of the percussion and roll of the timpani were powerful through the M2s -- but through the FC 9s they were explosive, the music grander, the physical energy of the orchestra more easily conveyed. Obviously, the FC 9s excellent dynamics and weightier low end were functions of its larger size, as was the fact that the Focus was capable of moving a greater volume of air than the PSB. The M2s smaller cabinet and single woofer can do only so much. Although both speakers performed at a very high level in my room, the choice of one over the other will likely have more to do with personal listening habits and the size of the listening room. However, when you consider that you can get a nearly full-range speaker for even less than the cost of a pair of M2s (given that youll need to buy stands for them), the FC 9s definitely make a case for themselves as a good deal, if you have the room to accommodate them. The Classic FC 9 was the first speaker Id heard from Focus Audio, and I found it impressive across the board. Its fitnfinish is stunning, and will likely have visitors to your listening room guessing they cost much more. Looks aside, the FC 9s greatest asset is its sound: pure, powerful, and precise, a collection of traits that made for an engrossing listening experience. If you have the space and are in the market for a well-designed, gorgeously crafted pair of floorstanding speakers, you should hear the Classic FC 9. Sonically and aesthetically, it offers a complete package that youll be proud to own and use for many years.